The Plumas County Fire Safe Council has coordinated multi-parcel fuel reduction in 13 communities since 2002. The Council began with a county-wide demonstration project in 2002 that treated 62 acres and has since implemented projects on nearly 2,000 acres. As a Natural Resource Advisor in Plumas and Sierra Counties, I have conducted comprehensive monitoring of 7 of the projects. 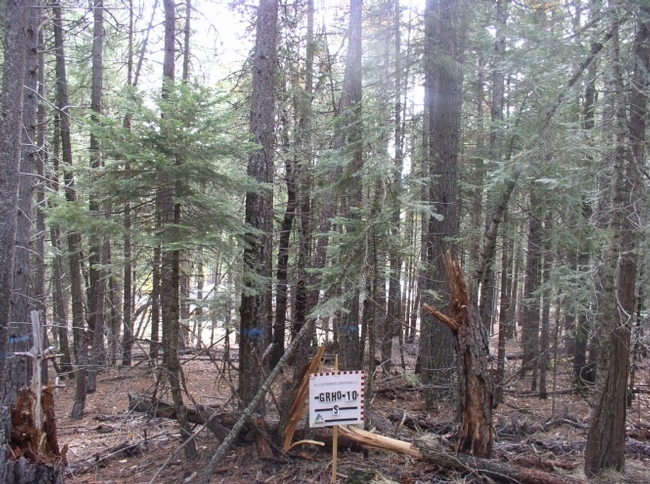 Coordinated community fuel reduction includes multiple property owners who often have little experience with forest management projects that involve tree thinning to reduce the accumulated fuel hazard. The property owners value their property for aesthetics, wildlife viewing, recreation and other reasons, but they often knew very little about forest fuel management when they bought it. Wildfires over the past several years have captured their attention, raised concern and caused them to seek fuel reduction assistance. The process, which has been mostly grant funded, can be challenging with many property owners, environmental planning requirements and contracting for services. The monitoring was conducted both prior to and following the fuel reduction treatment to address concerns that the projects were not meeting goals and to develop educational information. The monitoring included photographs, description of stand structure and composition, quantification of surface fuel ladder fuel and canopy cover and economic analysis. Pre-and post-treatment photography involved capturing images in the 4 cardinal directions from each plot center. The images graphically illustrate the fuel condition and how the treatment has reduced ladder fuel. Each community fuel reduction project involved from 9 to 12 tenth acre plots where all trees were measured to characterize stand structure and composition. 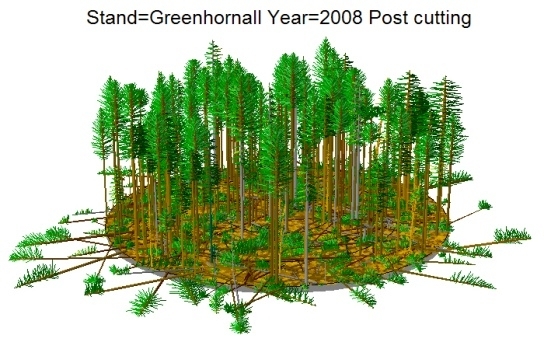 Stand visualization software was used to develop a graphic depiction of the stand prior to and following treatment. Monitoring found that prior to treatment “high risk” ladder fuel existed on an average of 54 percent of the plots with 4 communities having greater than 60 percent of the plots having high risk ladder fuel. In one case 98 percent of the plots had “high risk” ladder fuel. Post-treatment an average of only 3 percent of the plots had “high risk” ladder fuel while an average of 92 percent of the plots were now “low risk”. 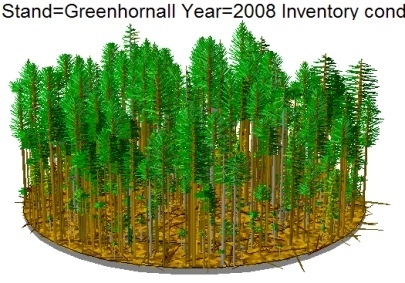 Canopy cover averaged 82 percent prior to treatment and was reduced to an average of 47 percent. Monitoring of community fuel reduction costs has shown that it will be difficult to complete fuel reduction at the community level without grant support. 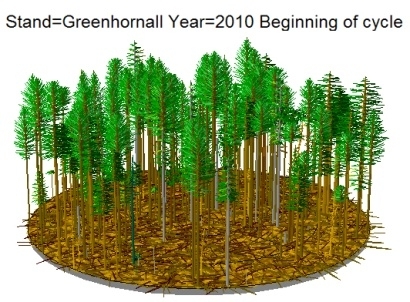 Cost of treatment per acre has averaged over $1,500 with grants covering about 63 percent of the cost and the value of fiber removed in the form of sawlogs and biomass covering the other 37 percent. 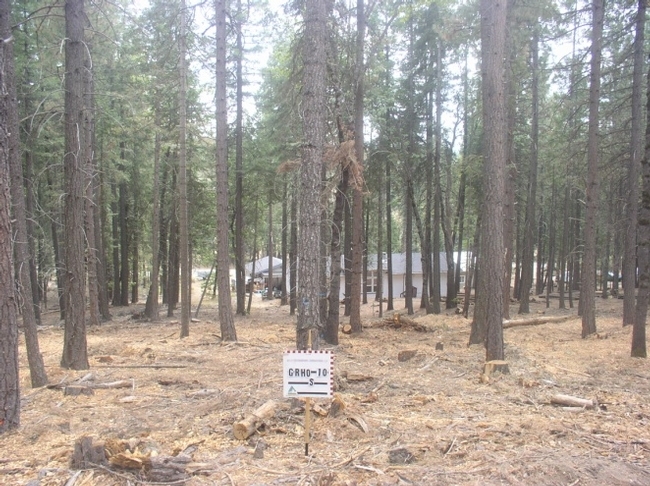 Only recently has the Plumas County Fire Safe Council begun collecting funds from the landowners to conduct the project and the amount has been limited to $250 per acre. It may be difficult to coordinate multiple landowners to accomplish fuel reduction at the community scale when they all need to have financial capacity at the same time. Surface fuel, stand structure and fire behavior data analysis have not yet been completed. Thus far the monitoring information collected has been used to help other property owners determine whether the Council’s community fuel reduction program is appropriate to their property or community. Very interesting study! Thanks for sharing this.